The interference is clearly apparent on film. The Play: Bregman led off the 6th inning of Wednesday's Astros-Rockies game with a fly ball to deep left field where outfielder Gerardo Parra jumped in attempt to catch the ball, which fell back onto the playing field as Bregman circled the bases, winding up at third base before all was said and done. The Challenge: Upon Replay Review as the result of a challenge by Rockies Manager Bud Black, it was determined that a spectator interfered with Parra by reaching out of the stands and touching a live ball, hindering Parra's opportunity to make the catch, and the Replay Official thus declared batter Bregman out on the play. "It was a f* joke, and they should be f* ashamed of themselves. Obviously, the guy has never played f* baseball before in his life, the guy in charge of whoever made that decision. "There is no possible way you can say that a left fielder jumping backwards into a wall is guaranteed to make a catch. It changed the whole f* game. We're up 2-1 at the time, I'm at third base. We need a fly ball to the outfield to get me in, and it's 3-1. It's f* horrible." Said Parra, "I never saw the fan touch the ball until I saw the replay, but I feel I would have had that ball." This isn't the first fan INT play at COL in 2018. Deja Vu: If you feel like we've been here before, that's because we have, yet with the opposite result. 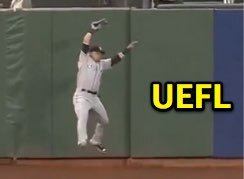 This is the second time in 2018 that a visiting team has taken umbrage with a Replay Review decision concerning potential fan interference on a fly ball to deep left field at Colorado's Coors Field. The first play of the season occurred on April 9, 2018, when 2B Umpire Brian Gorman ejected Padres Manager for arguing a review decision that affirmed 3B Umpire Dan Iassogna's spectator interference no-call that awarded Rockies batter Carlos Gonzalez with a home run. The write-up for that ejection report is at the following related link. 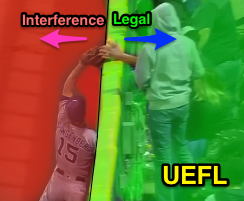 Related Post: MLB Ejection 011 - Brian Gorman (1; Andy Green) (4/9/18). The Rule: By definition, "Spectator interference occurs when a spectator (or an object thrown by the spectator) hinders a player’s attempt to make a play on a live ball, by going onto the playing field, or reaching out of the stands and over the playing field." Bregman was slightly upset with the call. Pursuant to Rule 6.01(e), "When there is spectator interference with any thrown or batted ball, the ball shall be dead at the moment of interference and the umpire shall impose such penalties as in his opinion will nullify the act of interference." Furthermore, "APPROVED RULING: If spectator interference clearly prevents a fielder from catching a fly ball, the umpire shall declare the batter out." The Claim: Bregman said, "there's no possible way a left fielder jumping backwards into a wall is guaranteed to make a catch." Fact Check: This statement is factually true. There is no way that such a catch is guaranteed. Rules-wise, the claim as false as most of George Washington's teeth. 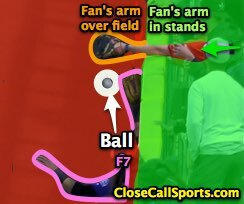 Rule 6.01(e) states that if interference "clearly prevents" a fielder from catching a fly ball, the batter is out. Bregman's statement—"is guaranteed to make a catch"—is 1) a much higher standard, and 2) not in the rulebook. I actually searched the Official Baseball Rules for the words "guaranteed" and "guarantee," and neither appear anywhere in OBR. So while Bregman is correct in that the catch is not guaranteed, the rules don't require this level of strict scrutiny in order to declare the batter out—if a catch is clearly prevented, it's an out. To be clear, this is not an "ordinary effort" situation, either—spectator interference only concerns itself with whether the interfering act "clearly prevents a fielder from catching a fly ball." In my view, it clearly did. Gil's Call: How many times has a player, coach, or manager said something about an official that makes you want to respond and correct the plethora of inaccuracies that have just spewed forth? 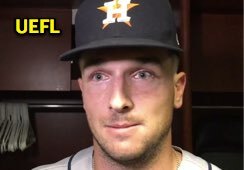 The spectator interference rule inaccuracy notwithstanding, Bregman made it personal by stating, "Obviously, the guy [in charge] has never played f* baseball before in his life"—let's entertain this statement. According to scheduling & stats scout Russ, Brian Gorman and Gary Cederstrom's crews are in Replay this week. Gorman—well, we all know the Tom Gorman story of how Brian grew up with baseball—and Cederstrom lettered in baseball for the Minot State College Beavers. As for Senior Director of Instant Replay Justin Klemm, this interview with Midwest Ump Pete Reiser revealed that Klemm played ball at Temple University before starting his minor league umpiring career. Regardless, pursuant to Bregman's logic, unless one is familiar with the fielding acumen required for a particular play, one has no authority to rule on it. ...jumping backwards into a wall. Thus, as for Bregman's claim that an outfielder jumping backwards into a wall lessens the likelihood of a catch...Bregman is an infielder who has played a total of 3.2 innings in the outfield over the course of his three-year career. ...which means that 3.2 innings in a Major League outfield may or may not be enough experience to determine what a career outfielder like Parra is and is not capable of. In my estimation as a center fielder who never quite made it past high school ball, if a fan reaches out of the stands and puts a hand in front of my glove while I'm tracking a fly ball, even jumping for it, the fan has clearly prevented me from catching said fly ball. Perhaps it's the fielder in me, but I have an out...though your mileage may vary.